I just finished my first commissioned sock monkey. I am getting ready to make 4 more for the shop. I'm selling them for $20 to friends and blog readers and $25 in the shop. I would love to customize one for you. In other news, a couple of our favorite local Alabama bands (The Civil Wars and Doc Dailey & Magnolia Devil) are playing a show to benefit victims of the tornados and they will be streaming it live for $10. All proceeds will go towards tornado relief. For information on watching the show live go here. This is very cute, great job!! Thank you sweet friends. I am so nervous about putting them out there. I may not be able to wait to do yours. 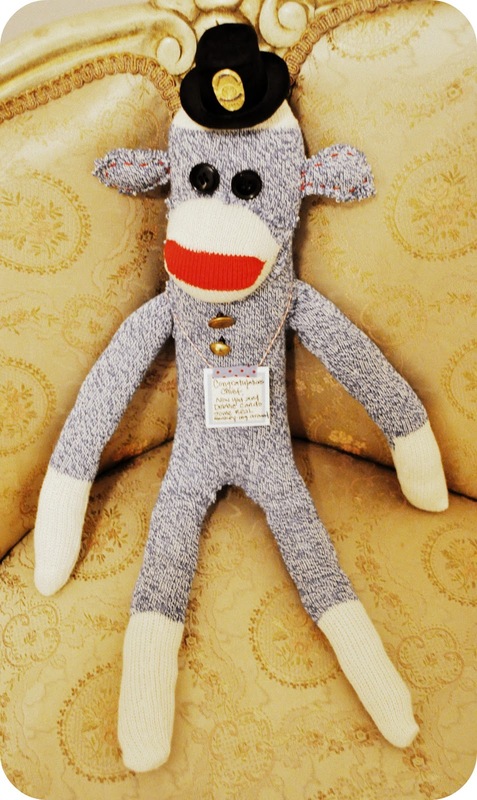 I have so many ideas on how to make an Amanda monkey with vintage trimmings. I'm working on something else for you right now. YOU are going to love love love it. I will have to order one soon! CUTE CUTE CUTE!!! Good work!